My principal motive was selfish: I did it for me! I had been travelling for over 20 years, but in all that time had kept a diary maybe twice or three times. This is because, although a diary is nice to read afterwards, writing one in the conventional manner does not make for a life-enhancing experience at the time. 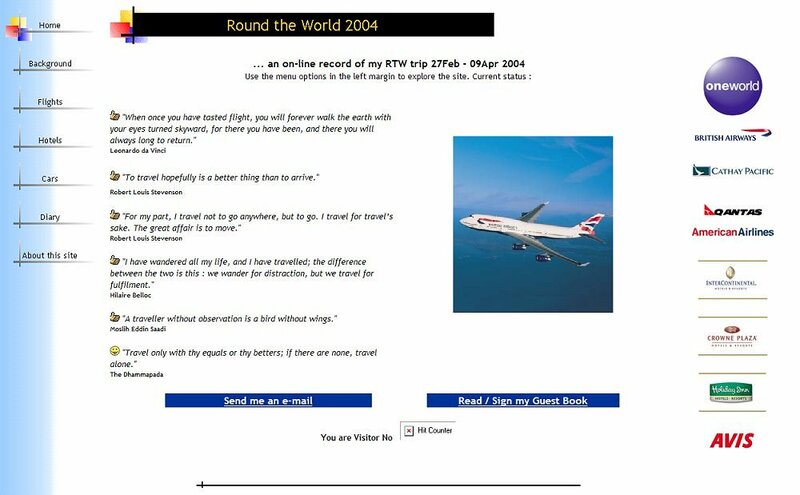 By doing this instead, I hoped to have a bit of fun, bring some of my photos into the story and hopefully end up with a colourful, evocative and interactive memento of - initially - my Round The World trip, 2004. I'm pleased to say it worked! Not only that, but the response of others as my RTW 2004 trip unfolded was overwhelming. It seems I built up quite a band of faithful followers! Needless to say, it was most gratifying to see other people keeping up with my travels and deriving some enjoyment from this. Why the cloak of anonymity? Mainly in the interests of privacy and security while I'm away. 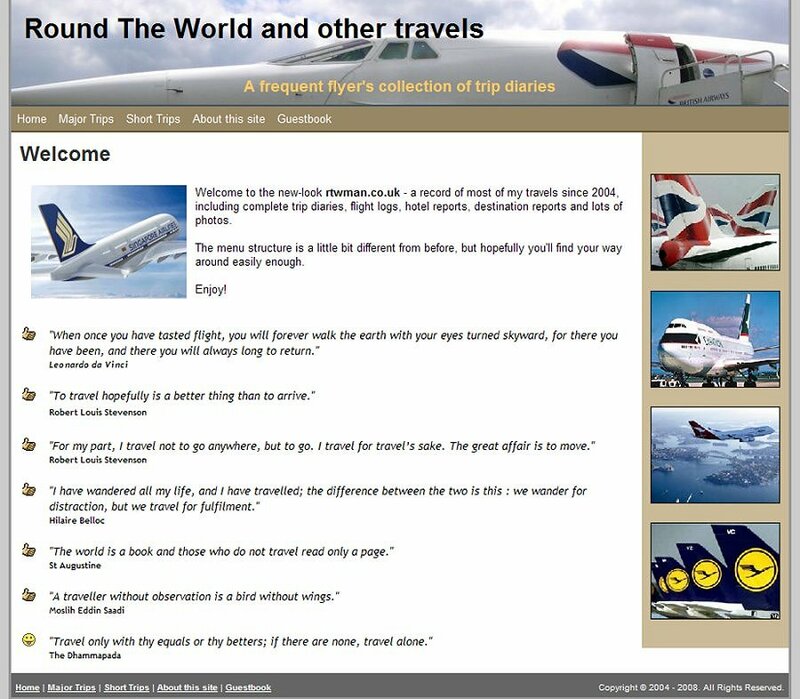 This website was initially built using Microsoft FrontPage 2002, but was migrated to a standards-based format using Expression Web 2 in Autumn 2008. Why the slight change of format in Summer 2004? In its original format, the site documented a single trip: my Spring 2004 RTW. 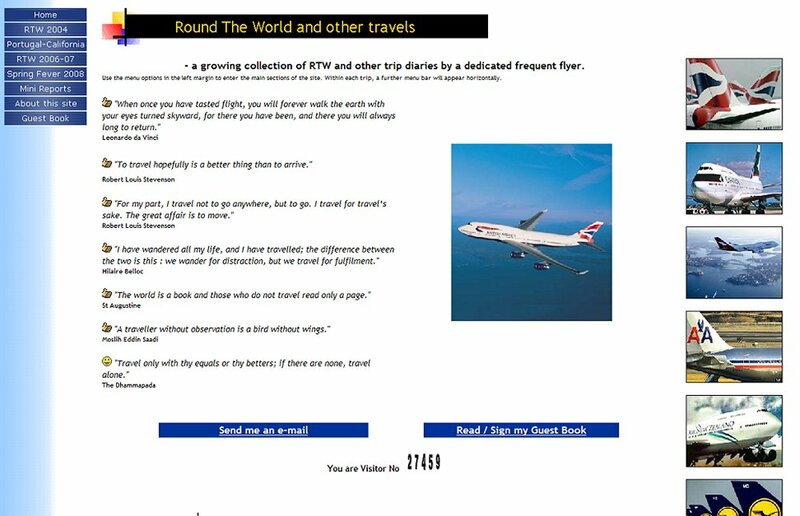 It was always my intention to keep the site alive by adding further trip reports. This meant introducing a different menu structure: one menu to select the trip and a subsidiary menu to move around within the context of the selected trip. I realised, somewhat late in the day, that FrontPage was discontinued and would soon no longer be supported. The site had a severe attack of the gremlins in Spring 2008, directly traceable to FrontPage Server Extensions. The conclusion was clear: time to move on, go for a re-design and ditch those pesky FrontPage Extensions! Hopefully the new look will prove popular.